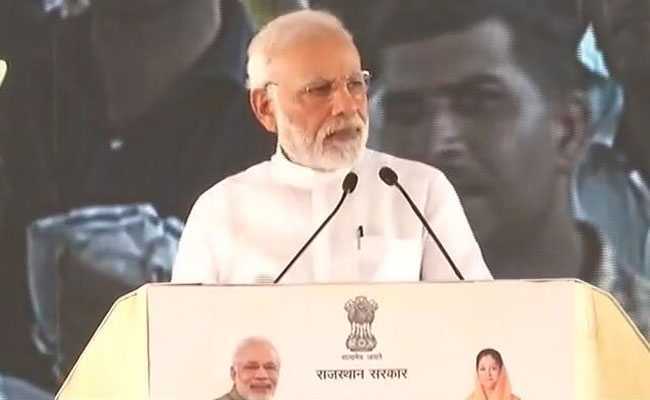 PM Narendra Modi in Jaipur: The prime minister is addressing a public rally in the city, will seek feedback from around 2.5 lakh beneficiaries of government schemes. Prime Minister Narendra Modi is in Jaipur today to lay the foundation stone for 13 urban infrastructure projects and meet the beneficiaries of central and state run public welfare schemes. The prime minister will seek feedback from around 2.5 lakh beneficiaries of government schemes. 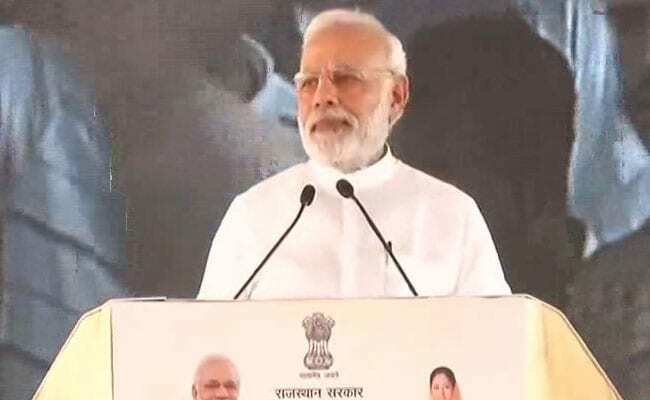 Prime Minister Modi, at the 'Pradhan Mantri Jansanwad programme' at Amrudoon ka Bagh in Jaipur, will have meetings with beneficiaries of the Ujjwal Yojana, the Pradhan Mantri Sanwad Yojana, the Mudra Yojana and the National Child Health Programme which are being run by the Central government and have benefitted more than 95 lakh people in Rajasthan. He will also talk to beneficiaries of state government schemes such as the Rajshri Yojana, Bhamashah Swarthya Beema Yojana, Scooty distribution scheme, Palanhar scheme, Workers Diary Registration and Deen Dayal Upadhyay senior citizen pilgrimage scheme which have benefitted over 39 lakh people in the state. Rajasthan Chief Minister Vasundhara Raje will accompany the prime minister during his visit. "Look at the Congress today. Many senior Congress leaders are out on bail... People have started calling Congress a 'Bail-gaadi'"
The Centre has increased the MSP for farmers by nearly twice of what it was. A recent international report shows that more than 5 crore people have been pulled out of poverty in the last 2 years. "The way the programme in Jaipur has been organised is commendable. Hearing beneficiaries is wonderful. There are some people who will never appreciate good work done, be it by the Centre or by Vasundhara Raje but everyone must see the happiness of the beneficiaries here," says PM Modi. "Never forget the tough circumstances in which Vasundhara Raje took oath in 2013. When she took oath, systems were not working properly. She has changed the work culture in the state," says PM. Rajasthan, known for giving a grand welcome, giving so much love to those who visit... I am witnessing it today in person. This is the land of the brave... I salute it. There is a balance between strength, courage, faith... and it is a part of the way of life here. Rajasthan has always inspired people from all over the country... history is full of evidence of this. 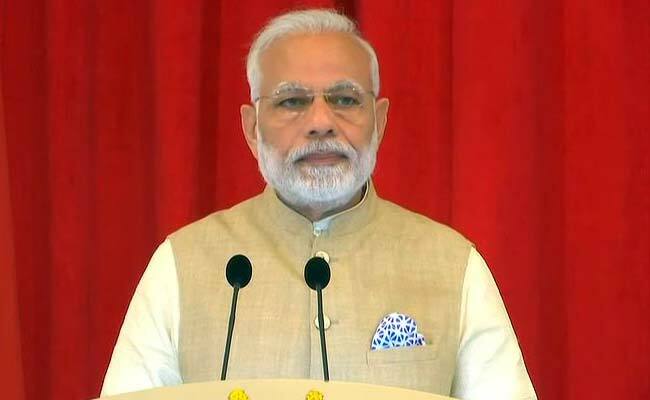 PM Modi begins speech, says "I salute this brave land"
The Rajasthan High Court has allowed the state government to build a helipad at the tennis court of Sawai Man Singh Stadium in Jaipur to facilitate the landing of Prime Minister Narendra Modi." Two helipads have been constructed at the SMS stadium in Jaipur. Sensitive areas in the city are covered by CCTV cameras, and temporary control rooms will alert the field units if they spot any suspicious activity. Additional Director General of Police N R K Reddy said all security arrangements are in place for the prime minister's visit today. Security drills have been conducted to eliminate last-minute glitches. GAD joint secretary Rajeev Jain has given directions to all district collectors that the cost would be met from the funding under the welfare schemes. According to an order of the General Administration Department (GAD), the government will spend Rs 722.53 lakh to bring people from 33 districts to the state capital. The money for this will largely come from funds for the schemes. Reports suggest that the state government has arranged 5,579 buses to bring people to the Amrudon Ka Bagh stadium. The administration expects a gathering of about 2.5 lakh beneficiaries of 12 schemes run by the BJP governments at the Centre and in the state, where the party faces a crucial assembly election later this year. The Rajasthan government is reportedly spending over Rs 7 crore to ferry beneficiaries of welfare schemes to Prime Minister Modi's mega rally. It is estimated that around 4.5 crore people of Rajasthan have benefitted from around 160 government schemes. Prime Minister Narendra Modi will also speak about the Abhinav Yojana Mukhya Mantri Jal Sawavlamban abhiyan launched by state government. Under this scheme, 3,50,000 water conservation resources will be constructed in state in three phases to collect water and more than 88 lakh saplings will be planted near them. He will also talk to beneficiaries of state government schemes such as the Rajshri Yojana, Bhamashah Swarthya Beema Yojana, Scooty distribution scheme, Palanhar scheme, Workers Diary Registration and Deen Dayal Upadhyay senior citizen pilgrimage scheme which have benefitted over 39 lakh people in the state. Prime Minister Modi, at the 'Pradhan Mantri Jansanwad programme' at Amrudoon ka Bagh in Jaipur, will have meetings with beneficiaries of the Ujjwal Yojana, the Pradhan Mantri Sanwad Yojana, the Mudra Yojana and the National Child Health Programme which are being run by the Central government and have benefitted more than 95 lakh people in Rajasthan. Prime Minister Narendra Modi is in Jaipur today to lay the foundation stone for 13 urban infrastructure projects and meet the beneficiaries of central and state run public welfare schemes. The prime minister, who will address a public rally in the city, will seek feedback from around 2.5 lakh beneficiaries of government schemes.